A type of fish that can be found in Malabal Tor. Abecean Longfins are fish that can be caught in ponds, lakes, and other bodies of water. They can be used as an alchemic ingredient. A type of cucumber that can be found on Artaeum. 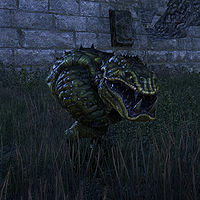 Air Atronachs are a new type of elemental created by the Serpent, who has corrupted and taken control of the Mage's atronach army in Craglorn. They supposedly possess the combined power of a flame, frost and storm atronach. Mehrunes Dagon was quick to adopt them as servants soon after their creation. 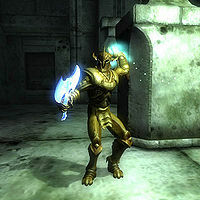 Akulakhan, also called the Second Numidium, is the name of the brass machine god built by Dagoth Ur under Red Mountain. 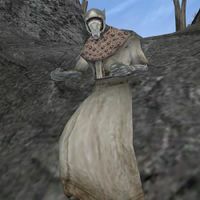 Using the divine influence of the Heart of Lorkhan to power Akulakhan, he planned to use it to drive all outlanders out of Morrowind, cast down the Tribunal, spread Corprus, and eventually take over all Tamriel. 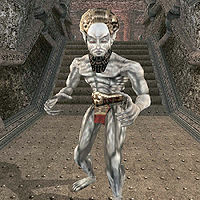 But, in 3E 427, the Nerevarine arrived at Vvardenfell, recovered Kagrenac's Tools – the Dwemer artifacts Wraithguard, Sunder, and Keening – and led an assault against Dagoth Ur's stronghold. Using the power of the tools, the Nerevarine was able to destroy the tonal enchantments on the Heart, killing Dagoth Ur and destroying Akulakhan. A type of fish that can be found in Stormhaven. A type of fish that can be found in the Alik'r Desert region. 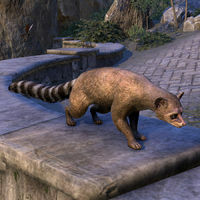 Passive possum-like animals that can be found all over Artaeum and Summerset Isle. 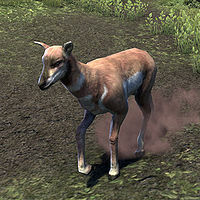 The Alit is a tail-less, two-legged predator common to the grasslands and ash wastes of Vvardenfell. Built like its larger and more dangerous cousin, the Kagouti, the Alit has a large head and protruding jaw, and when running on its short, stumpy legs, it looks like a big toothy mouth with feet. 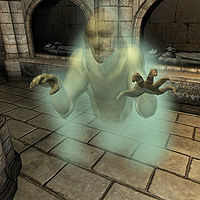 The spirits of deceased Dunmer, Ancestor Ghosts commonly defend the tombs of clan and kin, but may also be summoned and controlled by sorcerers. Ancestor Ghosts are aggressive, but not very dangerous to the prepared adventurer. These ghosts can curse those who attack them, and are immune to disease, poison, frost damage and mundane weapons. A more powerful form of the common Ancestor Ghost, Ancestor Guardians are immune to disease, frost, normal weapons, and poison. Dunmer have a unique, innate ability to summon Ancestor Guardians to aid them in battle, or to help them avoid blows. 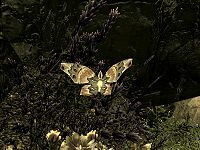 The Ancestor Moth is a rare moth that can be found in secluded Ancestor Glades scattered across Tamriel. They are attracted to the bark of a Canticle Tree and produce silk that can be used to make powerful clothing, once widely exported by the Cyro-Nordics. Ancestor moths are used by Moth Priests in the Ritual of the Ancestor Moth in order to read an Elder Scroll. The moths maintain a connection to the ancient magic that allows the Moth Priest to decipher them. Moths emanate a soft harmonious trilling that when amplified taps into a form of primal augur. This allows the moths themselves to become a conduit for deciphering the scrolls. By having the moths close to the Moth Priest, they can utilize the conduit and share the moth's augury. Ancestor moth chrysalises are green and smell of fresh grass and clean water. 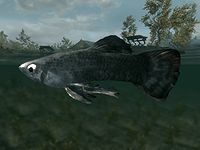 A type of fish that can be found in the oily waters of the Clockwork City. It is thought to be extinct. 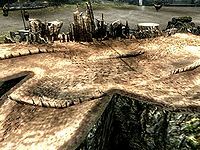 Ants are insects that can be found in Skyrim's undergrowth. A cousin of the deer. A type of fish that can be found in Greenshade. 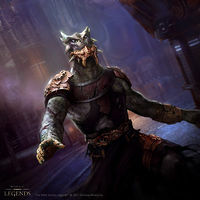 The Ascended Sleepers are distorted, half-mer, half-beast creatures transformed through the connection forged by Dagoth Ur to the power of the Heart of Lorkhan into powerful magical beings. Ascended Sleepers are highly intelligent, aggressive, and dangerous. The Ascended Sleeper is the form assumed during one of the final stages of the progression of Corprus. 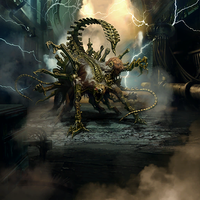 They can afflict their opponents with a variety of deadly Blight diseases as well as damaging frost and fire attacks. 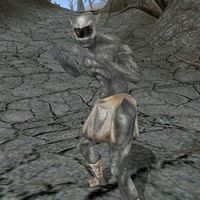 The Ash Ghoul is a distorted, half-human, half-beast creature transformed through the connection forged by Dagoth Ur to the power of the Heart of Lorkhan into a powerful magical being. Ash Ghouls are highly intelligent, aggressive, and dangerous. 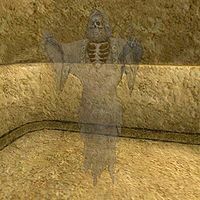 The Ash Ghoul is one of the forms taken by a being during the progression of Corprus. They can cast a variety of minor spells, including spell reflection. 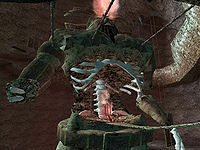 Ash Guardians are golems resembling Storm Atronachs, created by the Telvanni of Solstheim during their study of the Ash Spawn. They can be summoned from the ash, but will attack indiscriminately unless controlled with a Heart Stone. Ash Hoppers are moderate sized insect creatures found in Vvardenfell and southern Solstheim. The Amber Ash Hopper species is native to the upper Ashlands and the slopes of Red Mountain and can be taken in as low maintenance pets. The Deep-Moss Ash Hopper species is native to the fungal-forested uplands and the coastal marshes of southern Vvardenfell. They are the mascot bugs of the Buoyant Armigers due to their admiration of their green carapaces. 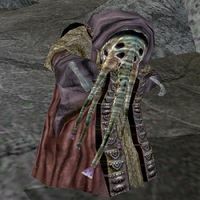 The Ash Hoppers of Solstheim differ in size and have a head shape which is somewhat like Scrib. They are hostile to travelers unlike their more docile Vvardenfell counterparts. Their meat and jelly is used in cooking and alchemy, and their chitin can be used in creating traditional Dunmer armor types. 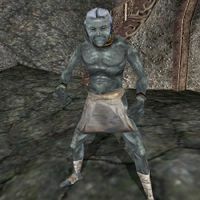 The Ash Slave is a humanoid creature transformed through the connection forged by Dagoth Ur to the power of the Heart of Lorkhan. These creatures are aggressive and dangerous. An Ash Slave is a being in one stage of Corprus' progression. They can cast a variety of minor spells including spell reflection. 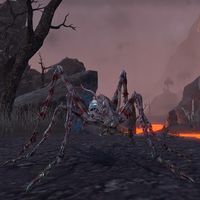 Ash Spawn are creatures found in the Ashlands of Solstheim. They began to appear on the island after the massive eruptions of Red Mountain early in 4E 5 and onward covered the southern part of the island in ash. Their spawning from the ash is caused by heart stones, which contain some trace of the Heart of Lorkhan's power and give life to bones found buried in the wastes. The Ash Titan is a fiery variant of the Daedric Titan that serves Mehrunes Dagon instead of Molag Bal. 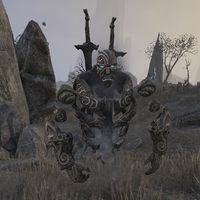 A very powerful creature created by the connection forged by Dagoth Ur to the power of Heart of Lorkhan. They take a tall, sinewy form with clawed hands, similar to Dagoth Ur himself. They serve as the nobility of House Dagoth. Note that despite being called "vampires", these creatures are not actually undead, and it isn't possible to catch vampirism from them. They should only be approached with caution by the most experienced and well protected adventurers. A humanoid transformed through the connection forged by Dagoth Ur to the power of the Heart of Lorkhan. They are hostile and will attack on sight, although they can be calmed using spells. When spoken to, however, they can only repeat a few agonized phrases. Like the other ash creatures, it appears that Ash Zombies were once Dunmer. 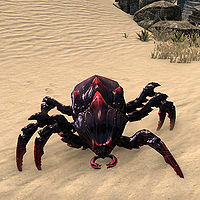 Assassin Beetles, known to the Yokudans as 'Samara Scarabs', are hostile, large insectoid creatures found across Tamriel. Aurorans are an idealized humanoid race of Daedra in the service of Meridia, and are made from pure light. Their armor usually appears golden in tone, but since they come from the Colored Rooms, Aurorans can be of any tone. These beings have magical control over color and hue, being able to manipulate certain spectra of light into working on their behalf. They are formidable foes in combat, using some shock-based magic and are resistant to both magic and lightning. They wield powerful axes infused with lightning, and may combine in phalanx formations to channel powerful light to attack their foes. They are viewed as exhibiting pretensions beyond their worth, and are believed to lack a comprehensible hierarchy. When an Auroran knight manifests on Tamriel, they can summon Daedric warhorses from the Colored Rooms of various hues also made from pure light, which sometimes remain in the mortal plane if the knight is banished. Aurorans choose their allegiances very carefully, usually only fighting under other servants of Meridia. 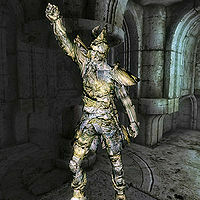 Meridia's Golden Knight, Darien Gautier, shared a similar nature to Aurorans as he was made from Meridia's light. 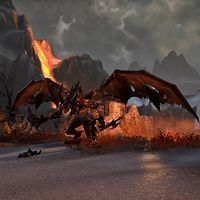 In the presence of Dark Orbs, they are blessed by Meridia with uncanny vigor, being healed, resurrected, and even prevented from being banished to the Void as long as they remain in close proximity of the orbs. Orbs of certain shades of light can control Aurorans of the respective color. An animated statue wearing elven armor and weapons. A type of fish that can be found in Coldharbour. This page was last modified on 17 January 2019, at 12:16.